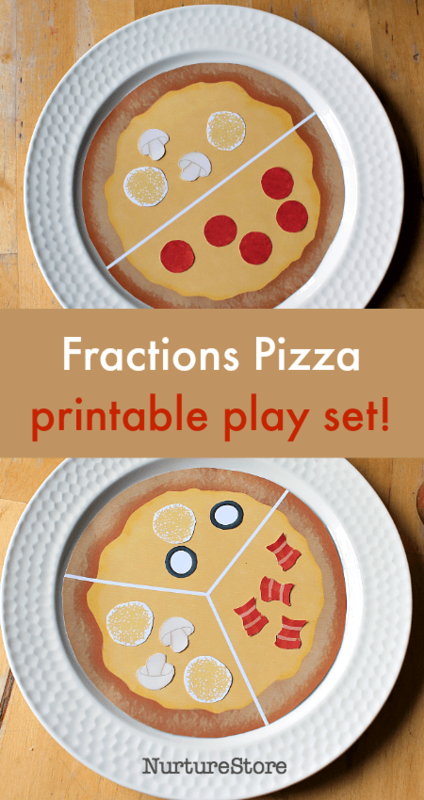 This free pizza fractions printable play set is great for making math fun. You can use the printables for a role play pizza parlour and let your children weave math naturally into their games as they play. Such a fun way to introduce fractions. Print your pizza set – see how below. I recommend printing on card to make your pizzas more durable. Cut out the pizza bases and toppings, laminating them if you like. Set up a role play pizza parlour – with a phone and notepad to take orders for delivery, or a table and place settings to serve them in a restaurant. Invite your child to explore and play! 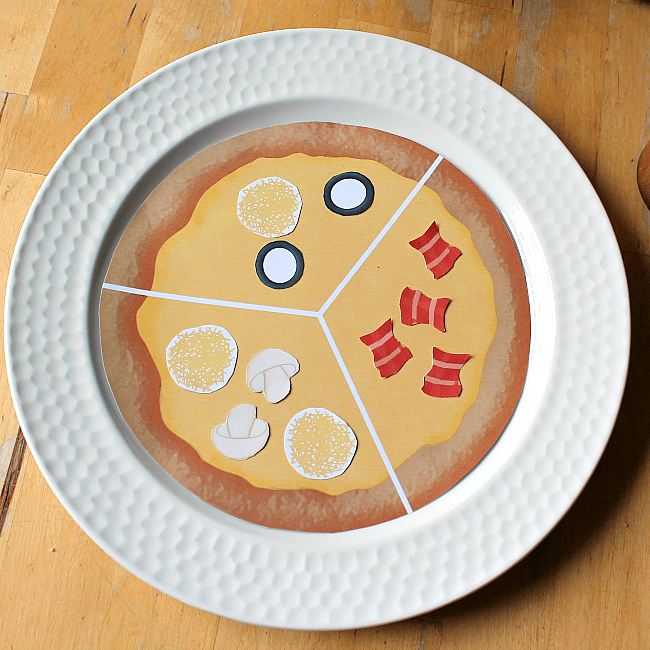 :: You can use the pizza printables for imaginary role play. Set up a pizza delivery service with a phone, notepad, and street map. Some children can phone in their orders, others can make and delivery their pizzas. You could also set out tables and place settings to make a pizza restaurant dramatic centre, with some children being diners, some children serving. Imaginary role play like this is a wonderful way for children to try out social situations and develop language skills. Conversations where you need to take turns, collect key information and use mathematical language happen naturally when you’re serving pizza! What would you like on your half? How many slices of pepperoni do you want? :: Depending on your children’s age and stage you might include a menu with prices, so they can work out their bill and make change. :: They might also use a street map to locate the addresses they need to deliver too. You could make a simplified version of a city map, split into a grid so your children can work out which co-ordinates they need to deliver to. :: You can also use the pizzas to play around with fractions. Perhaps you and your child will share a pizza: What do they want on their half? Who’s got more olives? If a friend comes to join in with your pizza, how many pieces to do now need to split your pizza into? What will you put on each of these thirds? :: Everyone can have a copy of a pizza base printable to make their own customised pizza. Perhaps they can have ten topping items each – how will they split their ten choices between pepperoni, mushrooms and olives? :: Extend your topping selection by giving olives a cost of 1p, bacon a cost of 2p, pepperoni a cost of 5p. If they have 25 pence to buy some toppings, how will they split up their money? :: Print out all four variations of pizza base and design the perfect whole, half, quarter and third topping combinations. 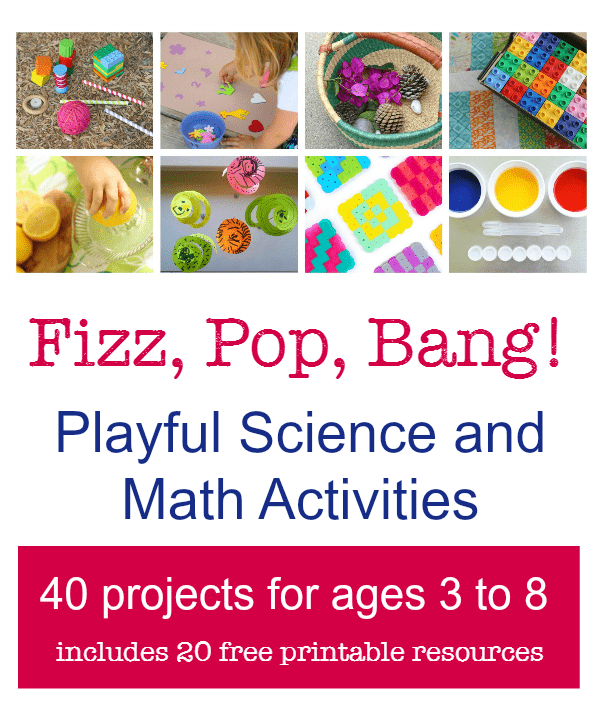 If you’re interested in hands-on math resources, you’ll love this too! While you’re here, get your copy of my Fizz, Pop, Bang! Playful Science and Math Activities. It’s such a good resource for hands-on math ideas. >>>>> Click here to get your copy before you leave! Trying to access the fraction pizza printables, but not having any luck–please help! Hi Heidi. Which step of the instructions are you up to? 1. Have you joined by putting your email address in the sign-up box? 2. Have you checked your in-box for the confirmation email, and opened it? 3. Or are you already a subscriber and you have put your email address in the box to sign in?